Mills, Edward and Harold D. Kalman. "Architectural History of Indigenous Peoples in Canada". The Canadian Encyclopedia, 13 February 2019, Historica Canada. https://www.thecanadianencyclopedia.ca/en/article/architectural-history-early-first-nations. Accessed 21 April 2019. Indigenous peoples in Canada developed rich building traditions thousands of years before the arrival of the first Europeans. Each of the six broad cultural regions of Indigenous peoples in Canada, defined by common climatic, geographical and ecological characteristics — the Arctic, Subarctic, Northwest Coast, Plateau, Plains and Eastern Woodlands — gave rise to distinctive building forms which reflected these conditions, as well as the available building materials, means of livelihood, and social and spiritual values of the resident peoples. A striking feature of all Indigenous architecture was the consistent integrity between structural forms and cultural values. The wigwam, tipi and igloo were highly evolved building-forms perfectly suited to their environments and to the requirements of mobile hunting and gathering cultures. 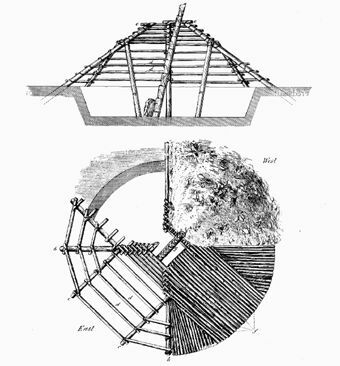 The longhouse, pit house and plank house were diverse responses to the need for more permanent building forms. In addition to meeting the primary need for shelter, structures functioned as integral expressions of their occupants’ spiritual beliefs and cultural values. In all six regions, dwellings performed dual roles — providing both shelter and a tangible means of linking mankind with the universe. Building-forms were often seen as metaphorical models of the cosmos, and as such they frequently assumed powerful spiritual qualities which helped define the cultural identity of a people over hundreds or even thousands of years. Eastern Woodland Indigenous peoples belong to two unrelated language families, Iroquoian and Algonquian. 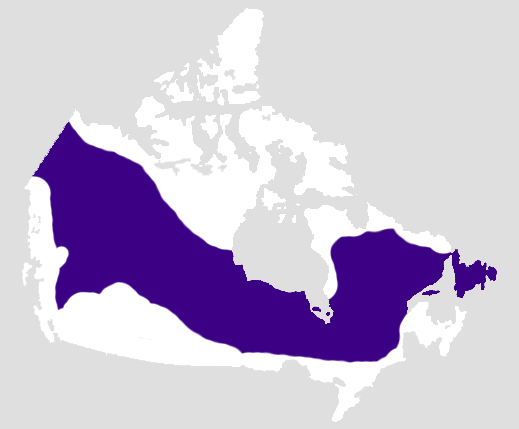 At the time of European contact, Iroquoian-speaking peoples, including the Haudenosaunee and Huron-Wendat, occupied much of what is now southern Ontario, northern Ohio, Pennsylvania and New York, and the St. Lawrence Valley as far east as the present-day Québec City area. 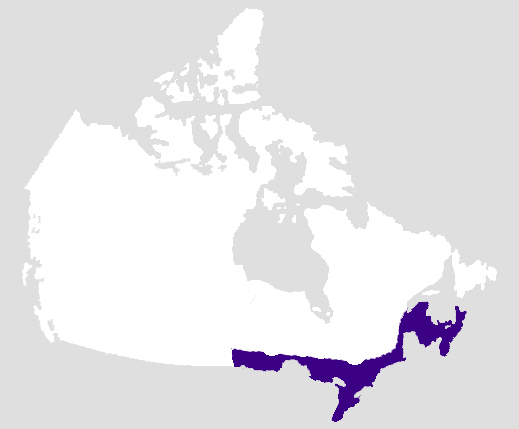 Algonquian-speaking peoples, including the Ojibwa and Mi’kmaq, extended from Lake Superior north of Lake Huron to the Ottawa Valley (see Ottawa River), and east through present-day New England and the Atlantic provinces. Ste-Marie Among the Hurons, near Midland, Ontario. Built c. 1640, reconstructed 1960s (photo courtesy Ste-Marie Among the Hurons). 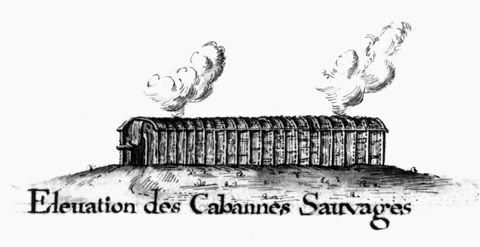 Drawing of a longhouse near Fort Frontenac (Kingston, Ont) circa 1720. Detail from a map of Fort Frontenac, Edward E. Ayer Collection, The Newberry Library, Chicago. From a photograph held by the Library and Archives Canada. 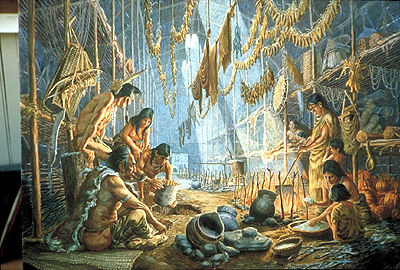 The characteristic Iroquoian dwelling was the longhouse, a long and narrow structure that was home to several related families. The rectangular structure was constructed of a double row of saplings, driven into the ground, bent towards each other, and tied at the top to form a flexible barrel-vaulted (deeply arched) frame. Sheets of bark were fastened between the poles, and additional saplings were attached horizontally on the outside for reinforcement. Posts down the centre might provide additional support for the roof, with holes in the roof venting the smoke from hearths inside. Sleeping platforms were arranged along the long walls, with a space for storage and door at either end. A number of hearths occupied a row down the centre, with each fire usually shared by two families, one living across from the other. 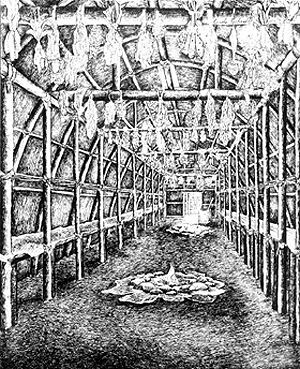 The typical Huron-Wendat longhouse was about 24 by 8 m, with three hearths; lengths varied between 9 and 55 m, with as many as 12 fires. A family might have had eight members, meaning that the population of a single house would have been about 16 times the number of hearths. The village consisted of a group of longhouses, often surrounded by a palisade of poles. Typically villages were located on defensible sites near water, wood and arable land. The Nodwell site near Southampton, Ontario, on Lake Huron, was inhabited in the mid-14th century. It had about a dozen longhouses surrounded by a double palisade. An estimated 500 people lived here for at least 20 years. Around the year 1500, the Iroquoian population expanded rapidly and villages became larger and more heavily fortified, with some villages accommodating more than 2,000 people. The Iroquoian villages and their longhouses are known from archaeology and from the descriptions and drawings of early European visitors. Explorer Samuel de Champlain wrote in 1615 that one village had “two hundred fairly large lodges.” The best known reconstruction of a Huron-Wendat longhouse is at Ste Marie Among the Hurons, near Midland, Ontario, at which Dr. Wilfrid Jury of the University of Western Ontario’s Museum of Ontario Archaeology attempted to replicate the early-17th-century Jesuit mission. (See also: Lawson Archaeological Site; Mailhot-Curran Archaeological Site; Dawson Archaeological Site; McDonald Archaeological Site). This painting circa 1850 (oil on canvas, 45.7 x 61.0 cm) was by an unknown artist who showed a mixture of knowledge and naivety (courtesy NGC). View of a Mi'kmaq wigwam, a man, and a child, probably Dartmouth, Nova Scotia, photographed 1860. National Anthropological Archives, Smithsonian Institution, Photo NO. 47728. Picture of Beothuk dwellings, drawn by Shawnadithit, 1820s. The Algonquian peoples were hunter-gatherers whose lives depended on cyclical movement within their territorial ranges. Their accommodation needs were met by a transportable building-type known as the wigwam. Although there were differences among nations and regions, the wigwam was generally a one- or two-family dwelling with a round or rectangular floor plan about 3.5 to 4.5 m in diameter. It was framed with saplings or pliable poles which were inserted into the ground and lashed together at the top. A series of light horizontal members (stringers) was tied to the frame to strengthen it, and to support the outer covering of sheets of bark, animal skins or mats of reeds. When people moved from one place to another, they would remove the exterior sheathing and take it with them, leaving the poles standing, to be re-used later either by themselves or by others. 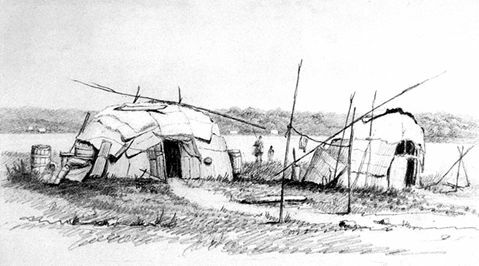 Mi’kmaq and other Algonquian peoples generally preferred a conical design to their wigwams. Typically four poles 4 m long were lashed together at the top, and the other ends were inserted into the ground. Additional poles were placed between the principal ones, converging at the top. The outer covering usually consisted of sheets of birchbark (see Birch) sewn together, but skins, woven mats, or evergreen boughs were also used. One or more rings of stringers reinforced the cone and held down the bark. The interior was a single space divided into several functional areas. The hearth occupied the centre, and cooking equipment hung from a rack below the smoke hole. The floor was covered with interlaced scented fir boughs, and furs were placed on top of these for sleeping. Possessions were stored around the perimeter. The Mi’kmaq winter camp consisted of one or more wigwams in the occupants’ family hunting or trapping territory. Summer settlements were arranged informally and may have extended along a section of coast or river bank. Conical wigwams similar to this were built by Algonquian groups to the east, north and west. 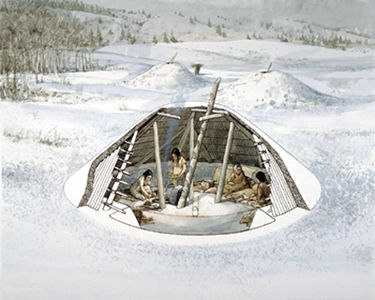 The groups who adopted this form include the Beothuk of Newfoundland, who built a polygonal mamateek, or winter wigwam. A mamateek is seen in a drawing of the 1820s by Shawnadithit, the last Beothuk. They also kept smaller conical summer mamateek, and rectangular smokehouses (drying houses) for venison. 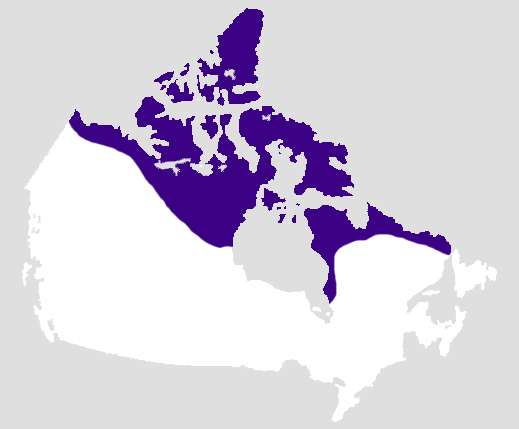 The term “Subarctic peoples” describes a number of different and unique groups, including the Dene, Cree, Ojibwa, Atikamekw and Innu. The Subarctic region consists largely of a five million square kilometre zone of boreal forest extending from the arctic tundra south to the mountains, plains and deciduous forest in the mid-section of the country. West to east, it extends from the Bering Sea to Labrador. 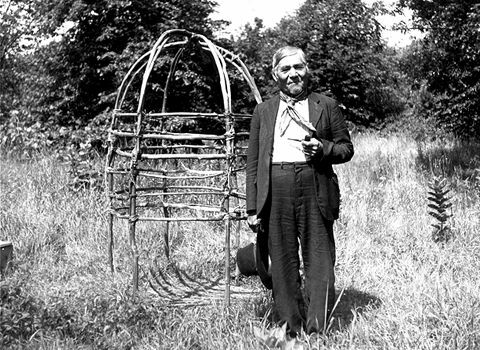 A Chippewa shaman standing beside the frame of his Shaking Tent (courtesy Milwaukee Public Museum, neg no. 50113). Frame of a Midewiwin lodge, Rainy River, Ont. Photograph by T.L. Tanton, 1934 (courtesy CMC/77894). The Cree of the North, who inhabited areas from Great Slave Lake to Hudson and James Bay, made use of a similar house-form to the Algonquians in the Eastern Woodlands. So too did the Ojibwa, who lived between Lake Huron and in the eastern Prairies. The difference was that they typically built circular, elongated and domed wigwams, usually as winter dwellings, and clustered in settlements. Cut saplings were set upright into the ground at intervals of about 60 cm. Opposite poles were bent towards the centre and their ends tied together with strips of wood. Horizontal members were added to strengthen the stressed frame. The lower portion might be sheathed with a row of mats woven from cattails, the upper part with sheets of bark. A smoke hole was left in the centre of the domed roof. The wigwam was sometimes elongated into a structure whose plan resembled the Iroquoian longhouse. 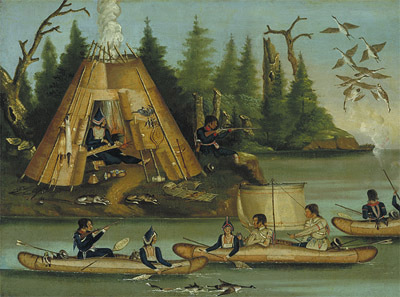 The Midewiwin, or Grand Medicine Society, of the Ojibwa and Lake Winnipeg Salteaux built lodges as long as 30 m, which shamans would use for initiation and instructional ceremonies. These and some Algonquian groups developed modified variants of the wigwam to serve specialized purposes. These included the sweat lodge, a small conical tent in which water was thrown on hot stones to produce steam; the menstrual hut, a small wigwam used by women during their menses; and the smallest of the lot, the shaking tent. The shaking tent, used by a shaman in the course of his duties, was a circular, open-topped structure, perhaps 1.2 m in diameter, shaped much like a large barrel and usually covered with rawhide. The shaman would enter the tent after dark, and would summon his spirit helpers with his singing and drumming. The Canadian prairies mark the northern edge of the Great Plains, a vast region bounded on the west by the Rocky Mountains and extending southwards to the Texas panhandle (see Prairie West). Until their eradication in the mid- to late 19th century, the region was home to vast herds of North American bison, and to distinctive Indigenous cultures — such as the Siksikaitsitapi (Blackfoot), Cree, Ojibwa, Assiniboine and Dakota — that were shaped by a dependence upon these animals. (See Indigenous People: Plains). The dark portion at the top represents the sky, the dark band at the bottom represents the earth . 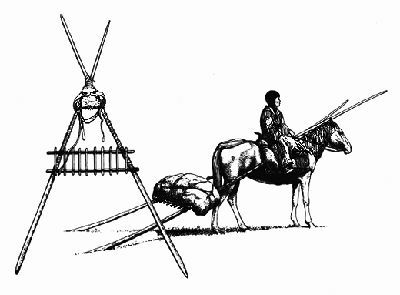 The horse-drawn travois was adapted from the earlier travois pulled by dogs (artwork by Gordon Miller). Like other hunting cultures, the Indigenous peoples of the Plains lived nomadic or semi-nomadic lives, which involved seasonal movements in pursuit of food and safe wintering places. Each year was shaped by carefully organized seasonal rounds that entailed a return to familiar camp sites at specific times of the year, either for hunting, social gatherings or for winter shelter. The Plains peoples developed a unique portable house-form, which was perfectly adapted to their way of life. This was the tipi (or teepee), a conically shaped structure fashioned from wooden poles and coverings sewn from the hides of the bison. Until the arrival of the horse on the Prairies in the late 18th century, the poles and covers for these tipis were pulled from one camp site to the next by dogs, while their owners walked alongside (see Travois). Horses increased the mobility and hunting capabilities of the Plains peoples and replaced dogs as the principal means of transporting possessions from one encampment to another. Because horses could carry far heavier loads, tipis increased in size and their furnishings became more elaborate and decorative. The precise origins of the Plains tipi are uncertain. Telltale rings of stones used to hold down the edges of skin tent covers mark the sites of ancient encampments dating back at least 5,000 years on the Prairies, and earlier still in regions to the north. All basic skin tents shared several common features: a central fire set beneath a smoke hole that was centred around the crossing point of the pole structure, an east-facing entrance, and a place of honour located opposite the entrance. 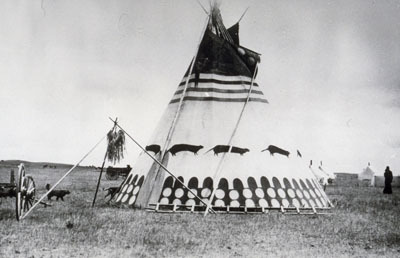 At some unknown date, Plains cultures made two innovations that transformed their skin tents into the tipi. The first of these was the development of a tilted conical form, in which the rear slope is steeper than that on the front (east-facing) side. As a result the floor plan of a tipi is egg-shaped, rather than circular. The tilted form permitted the smoke hole to be located beneath the crossing point of the poles, instead of at the centre point, making it possible to vary the size of the hole or close it entirely. The second innovation was the addition of two flaps (also known as wings or ears) that flanked the smoke hole and were supported by external poles. By moving these poles, the occupants could regulate the draft to improve ventilation and carry off smoke. Tipi design varied among the Plains peoples, a major difference being the number of primary poles used for the structural frame. The Siksikaitsitapi and their allies favoured a four-pole system, while the Cree, Ojibwa and Siouan-speaking peoples (Dakota) typically used a three-pole method. The four-pole system resulted in a somewhat more circular form and required fewer supplemental poles, but was less stable than the three-pole form. The affiliations of a particular nation’s encampment were easily identifiable at a distance by variations in profile, the shape of vent flaps and pole lengths. All aspects of tipi construction were performed by women, who debarked, smoothed and dried the numerous poles required for each tipi. The number and length of poles varied among nations and individual owners, a primary consideration being the owner’s wealth as judged by dogs or horses. A medium-sized Siksikaitsitapi tipi required about 20 poles averaging 7.5 m in length. Tipi covers were assembled from the tanned hides of bison cows that were killed in the spring or early summer when the fur was thinnest. These were cured then meticulously sewn with split sinew to achieve the precise semicircular shape dictated by the intended size and configuration of the tipi. Holes were cut along the outer perimeter of the cover to accommodate pegs which held the tipi close to the ground (stones were used in windy locations and for winter encampments). Smoking the interior of the finished tipi prevented it from hardening or cracking after a rain. Tipis were erected with the entrance facing east, the direction of the rising sun and opposite the prevailing wind. The frame poles were lashed together, then supplementary poles were arranged at regular intervals to achieve the correct profile. The cover was raised onto the back side of the frame using a special pole, then draped around the circumference and attached at the front seam that extended from the bottom of the smoke hole to the entrance by means of wooden lacing pins. Adjustments in the position of the poles and stakes helped stretch the cover to achieve a taut, smooth fit. A liner, also sewn from bison hides, was then installed around the interior circumference to reduce drafts and dampness and to prevent the casting of shadows onto the outer wall. The liners were referred to as “ghost screens,” because of this latter function. Bison robes were then arranged over a layer of freshly cut grass and a fire was lit within a ring of stones in the centre of the tipi. An altar for burning sweetgrass was placed directly behind the fire ring. The inhabitants sat and slept in locations that were established by social custom usually with the oldest man — the owner of the tipi — occupying the place of honour at the rear, western side of the tipi, behind the fire and facing the entrance. Sacred medicine bundles were hung on tripods within the tipi. Plains peoples developed powerful symbolic associations between the tipi and the spiritual realm. The tipi floor embodied the earth and the Mother; the lodge cover represented the sky and the Father. The poles connected the earth to the sky and provided trails along which the peoples’ prayers might reach the Great Spirit. A few tipis — perhaps one in ten among the Siksikaitsitapi — were covered with painted images which transformed them into sacred lodges associated with specific rituals. The images painted on these tipis reflected the distinctive iconography of the owners’ band or nation, and had both literal and cosmological meanings. Border designs at the base embodied the earth and things pertaining to the earth; those painted at the top depicted the sky and the spirit world. Between these two regions lay a zone that represented aspects of this world or another world that the principal occupant (or his direct ancestor) entered during a vision. Images in this area consequently ranged from depictions of human exploits to evocations of supernatural creatures that conveyed powers to the first owner of the vision. After the skins wore out, usually every year or two, they were replaced. The paintings on the old tipi cover would be transferred to the new one, and so the designs passed on from generation to generation. Plains peoples spent the summer and fall on the plains hunting buffalo and attending social and cultural gatherings that climaxed with the annual Sun Dance ceremonies. As winter approached they dispersed into smaller groups and established camps in sheltered river valleys. The precise placements of occupants and their belongings within individual tipis were mirrored in an equally formal organization of tipis within an encampment. On important occasions, encampments were organized in a circular form, usually with an opening to the east. Tipis were arranged in a precise order within this circle, band by band and family by family. Occasionally, these subdivisions formed subsidiary circles. Often, painted tipis composed a small inner circle within the core of the overall circle, particularly during major gatherings such as Sun Dance ceremonies. Although the Plains culture blossomed with the acquisition of horses and rifles, its survival was undermined by other aspects of European immigration. The loss of the bison herds, in the second half of the 19th century, had a devastating impact on the Plains Indigenous peoples. For a while they managed to cope, altering their diet and substituting canvas for buffalo hides for tipi covers. But they eventually lost their self-sufficiency, were forced to abandon their traditional semi-nomadic way of life and to move onto defined reserves (see Numbered Treaties). Gradually, the tipi gave way to imposed architectural forms associated with a sedentary existence. The central plateau region of British Columbia is bounded by the Rocky Mountains on the east and the Coastal mountain range on the west. This broad area is characterized by sharp contrasts in both climate and terrain: scorching summers and harsh winters; vast forests of pine, spruce and fir alternating with semi-arid expanses of grass and sage. 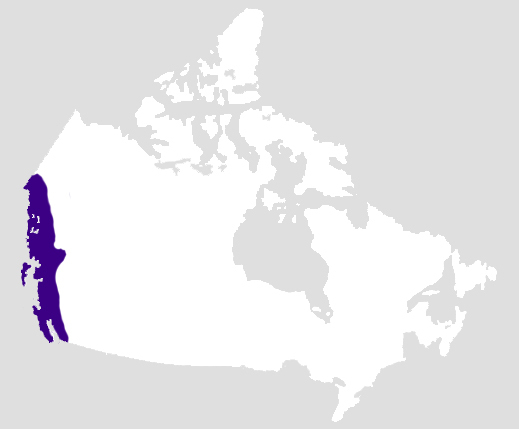 For thousands of years it has been home to various Salish-speaking peoples including the Tsilhqot'in (Chilcotin), Lil’wat (Lillooet), Nlaka'pamux (Thompson) and Shuswap. (See Interior Salish). During summer months, people of the Plateau occupied light pole-framed shelters covered with woven reeds or grass mats which were well-suited to their seasonal movements to fishing, hunting and wild plant gathering sites. In the winter, however, they lived in permanent hamlets of semi-subterranean dwellings known as pit houses, which were typically located at the eastern flanks of river valleys where mountain slopes offered protection from the prevailing winds. These buildings represented a distinctive and highly effective architectural form that was widely used throughout this region for at least 3,500 years. (See Indigenous Peoples: Plateau). Archaeologist James Teit drew this plan and cross section of a pit house built by the Nlaka'pamux (Thompson) Indigenous people in the Nicola Valley during the 1890s. Note the successive layers of logs and sod used to cover the roof. Pit houses were the winter underground dwellings of the Plateau people. The only entrance was at the top and it was reached by ladder (artwork by Gordon Miller). Pit houses were broadly characterized by a log-framed structure built over an excavated floor and covered with an insulating layer of earth. Some ethnologists (see Urgent Ethnology) have speculated that the prototype for semi-subterranean dwellings of this type originated in northeastern Asia. They believe that it was transferred to North America during migrations across the Bering land-bridge (see Beringia), then was gradually diffused throughout the continent, appearing first in the Arctic with the whale-bone house of the Thule peoples, then as the pit house of the plateau, and subsequently as the earthlodge of the American Plains and other pit house variants in the American southwest. Regardless of its origins, the pit house is regarded as perhaps North America’s oldest house type, and it was widely used throughout the plateau region until its eventual disappearance in the late 19th century. The most fully documented pit houses were those constructed by the Nlaka’pamux of the Nicola Valley in southern British Columbia. During the 1890s ethnologist James Teit carefully recorded the design, construction techniques and beliefs associated with the pit houses of these people. Construction began with the careful measurement of the pit circumference, which ranged from 7.5 to 12 m in diameter and was excavated to a depth of about 1 m with outward-sloping side walls. Four logs were then inserted in holes in the floor at an angle parallel to the excavation walls. Their tops were notched to support the four main roof beams, which were sunk into the topsoil at steep angles. A webbing of spaced rafters was then lashed in concentric circles from the outer circumference to the central smoke hole at the apex of the substructure. The rafters supported a snug layer of poles that was thickly padded with pine needles or grass. In the upper Plateau, where rainfall is heavy, cedar bark with the curved side up was laid at this stage. Finally, the excavated earth was spread over the roof and stamped down, and a notched-log ladder was lowered through the smoke hole. The following spring grass sprouted on the roof and, but for the protruding ladder, the dwelling seemed to be a living part of the landscape. The pit house ladder was once the object of artistic attention. Its top might be carved into the head of a bird or animal and painted to represent the guardian spirit of the head of the household. A central hearth was located near the foot of the ladder — usually on its north side — and a stone slab protected the ladder from burning. When covered with a layer of snow, the insulating efficiency of the pit house meant that only a small fire was required to warm the interior. Although pit houses had no interior wall partitions, they were nevertheless divided into four areas defined by the location of the four main posts. This division corresponded with the Nlaka’pamux’s cosmological view of the world as a huge, circular lodge that was divided into four compartments; after death, the soul crossed a river to the afterworld, which was also conceived as a large, round dwelling. The communities visited by Teit typically had three or four pit houses, with between 15 and 30 people occupying each one. Earlier pre-contact communities were frequently much larger, containing 100 or more individual houses. Pit houses varied considerably in size, configuration and construction methods among the various peoples of the Plateau. Some, like those of the Nlaka’pamux, were circular, others were elongated or square, and some had secondary entrances in the side of the roof. The Shuswap living in the Thompson River valley near present-day Kamloops, sometimes used six principal posts and beams rather than four, producing a more conical profile. The First Nations cultures on the West Coast of present-day British Columbia were shaped by the unique combination of temperate rain forest and comparatively mild maritime climate. The architecture of the coastal peoples exploited the abundant supplies of western red cedar to produce a remarkable Indigenous architecture that accommodated highly developed cultural beliefs and social patterns of living. The forests, coasts and rivers of the region offered diverse and abundant food sources. This abundance in turn permitted the development of complex social organizations that placed a premium on ancestry, status and wealth, which found expression through the architecture and artistic traditions of each coastal culture. 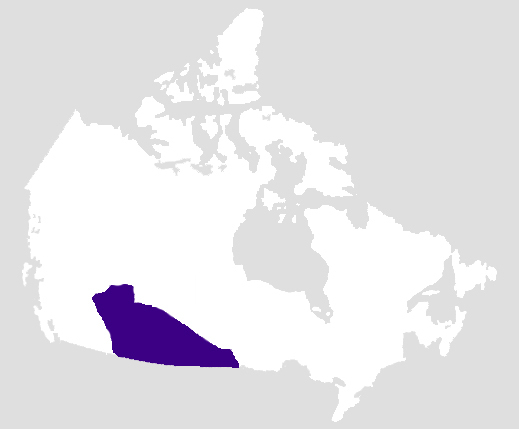 (See Indigenous People: Northwest Coast). 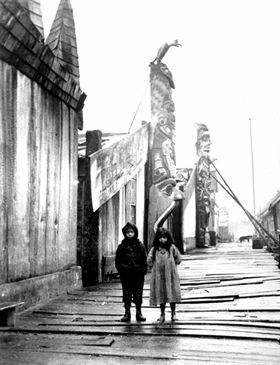 Haida proclaimed clan membership through an elaborate display of family crests, carved on totem poles erected in front of their houses (artwork by Gordon J. Miller). A close up view of Johnny Scow's house as it appeared circa 1918. Nuxalk Houses in the village of Qwemqtc (Bella Coola), BC, 1890s (photo by I. Fougner, courtesy Royal BC Museum/PN 4575). 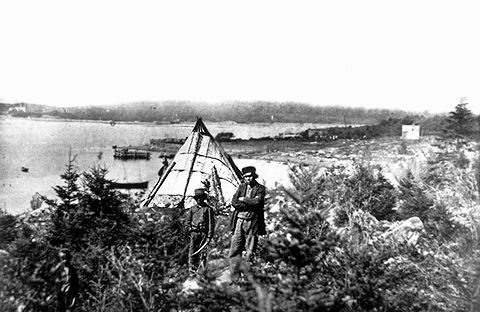 On Maude Island, Queen Charlette Islands, c. 1890 (courtesy British Columbia Archives and Records Centre, cat. no. 95517). The two principal roof beams are supported by pairs of posts at the front and the rear; the latter are carved. Two additional beams at the eaves connect the corner posts. Lighter rafters and purlins are framed on the beams. The wall and roof would have been planked. 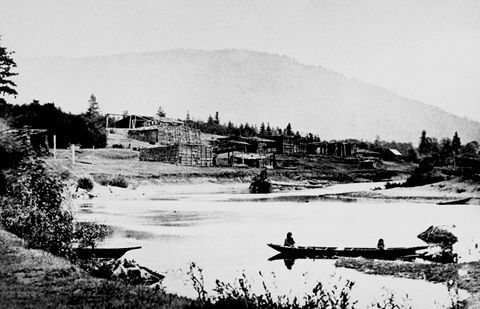 In Kimsquit village on the central BC coast c. 1881. The gabled roof is hidden behind the tripartite facade. Photo by Edward Dossetter (BC Archives and Record Centre, cat no. 33585). On the Queen Charlotte Islands, nd (courtesy British Columbia Archives and Records Center, cat. no. 83435). A Nuu-chah-nulth (Nootka) village, possibly Ahousat, as it appeared in the 1860s. (Cowichan), Vancouver Island as it appeared in 1861. The gable-roofed building at the extreme right is a mission church. F. Dally photographer (courtesy Royal British Columbia Museum, Ethnology Division, photo 1459). 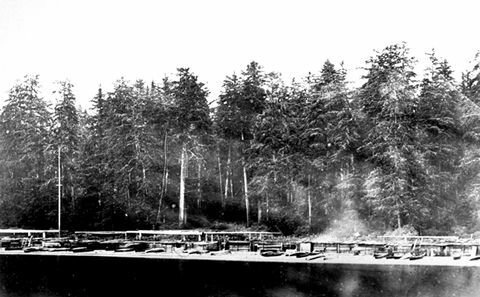 An 1880s photograph of the Xumtaspi-Nawittl village on Hope Island, BC. On the front of the house at the right are three painted family crests. Most coastal peoples occupied permanent winter village sites from fall to spring and lived in either fixed or portable dwellings in the summer — sometimes taking the planks that covered the building frames from the winter houses to enclose the frames of summer houses — as they relocated to harvest sea mammals, salmon and other fishes, gather berries and hunt. The social structure of the larger villages included a wealthy elite composed of chiefs or nobles, a body of commoners, and slaves who were regarded as outside the social order. The plank houses, as their buildings are called, were integral expressions of these hierarchical cultures. Villages were dominated by the noble elites, who owned most of the houses. In addition to accommodating extended families, the houses expressed the ancestral heritage and social standing of their owners through elaborate totemic imagery in the form of carved posts, painted screens and painted facades (see Totem Pole). Plank houses were regarded as living expressions of their owners’ prestige, family history and supernatural ancestors. They were the repositories for crest carvings and inherited or acquired treasures. Their interiors became the stages for ritual dances and dramas during midwinter festivals, and for gift-giving rituals known as potlatches that enhanced the power of chiefs and reaffirmed social relations. 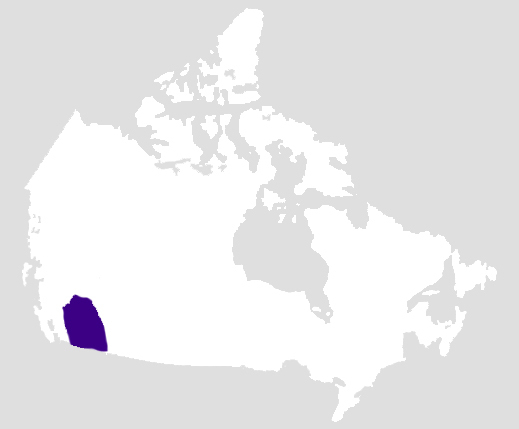 The principal groups inhabiting present-day British Columbia were the Coast Salish in the south; the Kwakwaka’wakw (Kwakiutl), Nuu-chah-nulth (Nootka) and Nuxalk (Bella Coola) on the central coast; and the Haida, Tsimshian, Gitksan and Nisga'a in the north. Each group developed distinctive variations on of the plank house. As with most other architectural forms developed by Indigenous peoples, those on the West Coast were affected and modified through contact with Europeans. In this region, European contact provided iron tools that led to a dramatic flowering of artistic expression during the 19th century, particularly among the peoples of the central and northern areas of the coast. Plank houses shared a number of structural characteristics, regardless of their builders. All employed varying forms of post-and-beam construction, which typically exploited the large lengths and dimensions of the red cedar. 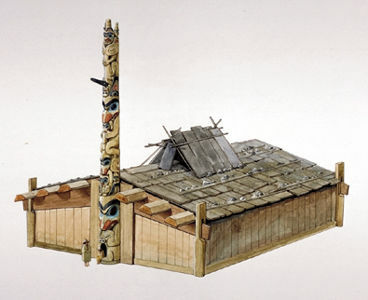 In the south, Salish-speaking peoples developed a shed-roofed variant that was characterized by a single roof pitch that sloped from front to back. The building’s frame system consisted of massive roof beams, often more than half a metre in diameter, which spanned the width of the house and varied in length from 7.5 to 15 m. These beams were supported by two rows of posts placed about 3.5 to 4 m apart. These beams were often carved to represent important family ancestors or supernatural beings associated with the family’s history. Overlapping roof planks were laid over pole rafters attached to the roof beams. Walls were clad with wide split-cedar planks tied horizontally between paired upright poles. In spring, these planks were usually removed and transported to standing frames at summer village sites. Shed houses varied widely in size. Some Salish villages comprised numerous comparatively small individual structures. In other instances, entire villages were made up of plank houses attached lengthwise to create lines that could extend as long as about 46 m in length. This modular system created a stockade-like wall that may have offered protection against hostile intruders. Early European observers assumed that these vast assemblages were single residences that accommodated entire villages. Archaeological research shows us that the Coast Salish occupied extensive settlements composed of large plank houses for many millennia, with numerous village sites spread throughout the Lower Fraser Valley (see Fraser River) and lower Vancouver Island areas. In contrast to the First Nations along the central and north coast, the Salish architectural form declined rapidly following European contact, possibly due to the ravages of smallpox. 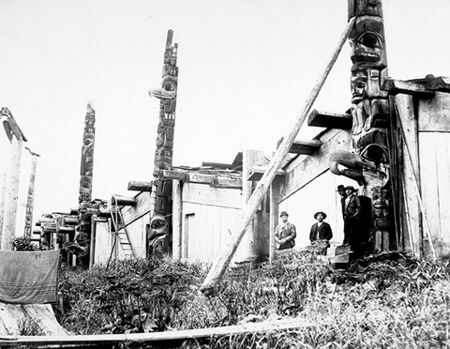 Nuu-chah-nulth, who lived on the West Coast of Vancouver Island, built two variants of the plank house. Those in the north erected gabled structures with a single roof beam, while those in the south built shed-roofed houses that bore some resemblance to their Salish neighbours. Their houses occasionally reached 30 m in length and were typically set broadside to the beach. Kwakwaka’wakw of the central coast lived in winter villages that often contained a dozen or more plank houses. These were arranged according to social rank in rows facing the ocean. Central coast peoples regarded winter houses as “spiritual associates” of family lines or lineages. The red cedar from which their houses were built was believed to be imbued with supernatural qualities which were conveyed through the plank houses and their furnishings. Ceremonial names and design motifs were carved and painted onto architectural elements to enhance the supernatural properties and prestige attributed to the family lineage. The facades of important houses were frequently decorated with dramatic paintings and carved poles that depicted the crests of the owner. Related to the sacred lineage ancestry of the house, they portrayed mythical events and signified the transformation of the house into a symbolic being during the winter ceremonials. House entrances were occasionally rendered as devouring mouths which dramatized the houses’ spiritual power to guests who entered during winter ceremonial gatherings. The plank houses of the Kwakwaka’wakw were essentially square, with sides ranging from 12 to 18 m, and gabled roofs. The two principal roof beams were supported by pairs of posts at the front and rear. Two additional beams at the eaves connected the corner posts. Vertical wall planks and roof planks were laid over a subframe of poles which was lashed to the frames. 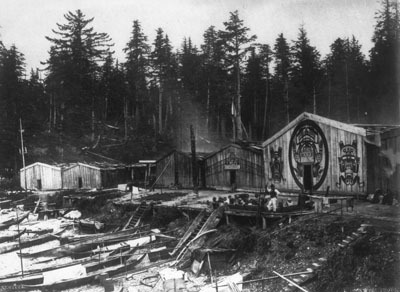 The Kwakwaka’wakw typically covered the gable ends facing the waterfront with vertical plank facades that occasionally rose above the roof line to create a raised pediment effect. Nuxalk occupied a territory of sheltered fiords on the central coast above the northern tip of Vancouver Island. 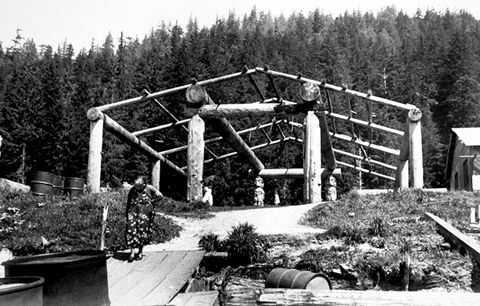 Early European visitors described Nuxalk villages in which plank dwellings were elevated upon pilings. The Nuxalk occasionally built houses with a tripartite facade that reflected the internal division into three equal bays and incorporated an excavated central fire pit. Alternatively, their houses assumed a gabled-roof form that was dominated by a central entrance pole. West Coast plank house architecture attained its greatest technical refinement in the harsher environment of the northern coast. The Haida, Tsimshian, Nisga’a and Gitskan built smaller, more tightly fitted houses than those of their neighbours to the south. 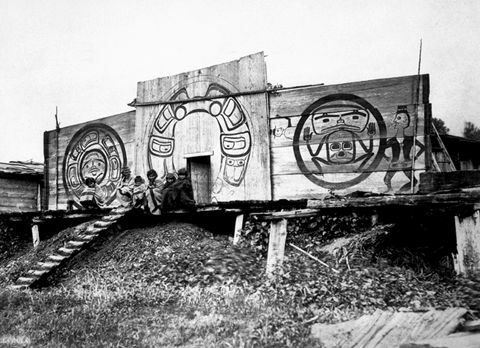 Typically about 12 m2, Haida plank houses were constructed in two primary forms. The more common type was the six-beam house, so-called because the building was framed with six large, longitudinal beams which projected beyond the gable wall ends. The six-beam house displayed highly sophisticated joinery techniques. Posts were raised at the four corners, and grooves at their bases received the ends of the wall plates. Massive sloping roof plates, cut from cedar planks as large as 75 by 15 cm, were inserted through slots in the corner posts and supported at the centre by pairs of posts, against which the frontal post was placed. Six large beams spanned the depth of the house, while a seventh beam at the ridge was broken to permit an opening for the smoke hole. The Haida also built a two-beam variant, as did the Tsimshian, who occupied the coastal area lying south of Haida Gwaii (formerly the Queen Charlotte Islands) and up the Nass and Skeena Rivers. Highly characteristic features of both Haida and Tsimshian plank houses were boldly carved house posts and frontal crest columns (totem poles). Unlike their counterparts on the central coast, exterior ornamentation on these plank houses was wholly confined to these sculptural elements. The houses of high-ranking people among both the Haida and the Tsimshian contained central fire pits, with steps leading down from the main floor level. As in the buildings of many other Indigenous cultures, the houses of the Haida and the Tsimshian represented the cosmos, providing symbolic (as well as a literal) accommodation for the spirits of past ancestors as well as for living and making the universe more readily comprehensible. Houses were all known by their names, and their construction was regarded as an important event marked by ceremonial potlatches. 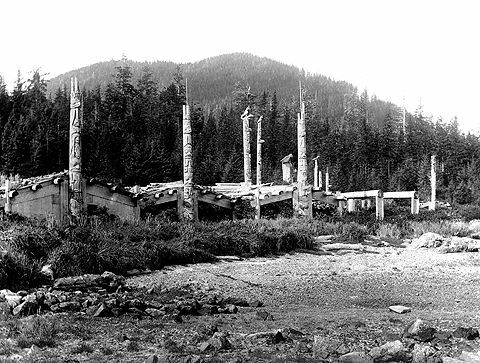 Nineteenth-century photographs of Haida villages offer glimpses of this unique architectural form towards the end of its high point, before the ravages of smallpox had decimated the population. They depict dramatically sited villages composed of rows of tightly spaced gabled houses, the horizontal thrust of their massive timbers boldly contrasted by ranges of lofty crest poles that celebrated the rich sculptural traditions and cultural beliefs of this vigorous culture. The Canadian Arctic has supported habitation for many thousands of years, despite a climate and terrain that appear to southerners as remarkably hostile. It is a land with little tree growth, and one whose ground is generally subject to permafrost. Summers are warm but short, a season devoted to intense outdoor life, with constant hunting (for sea and land mammals) and fishing. Winters are long, dark and cold, a time characterized mainly by indoor life. While the history of Arctic building may go back some 25 millennia, knowledge of early cultures and their dwellings remains scanty. More is known about the Thule, who began to occupy the Arctic, from Alaska to Greenland, about 1000 AD. The Thule adopted separate house types for winter and summer, each responding to the environmental and behavioural conditions of its season. (See Indigenous People: Arctic). The floors and lower walls are made with flagstones, and the roof is held up by whale bones covered with skins and slabs of rock. The house is then covered with sod (courtesy CMC). The Thule winter house was a sophisticated semi-subterranean structure, designed to provide comfort and warmth for prolonged periods of indoor living, often over the course of several years. It was built with whatever materials could be found: principally stone, earth, moss and whalebones, but sometimes also driftwood and sod. Typically the house was oval in shape, with the external diameters between about 3 and 9 m, and might be dug as much as 1 m into the ground. A narrow, underground entrance passageway, a few metres long, angled up into the floor, provided an effective cold-trap. Cold air would be displaced to the lower part of the passage, away from the living space. The floors and walls were lined with stones or other solid materials. The most impressive feature was the roof, supported by a structural frame which, in the central and eastern Arctic, was usually made from whalebones, which supported a variety of roof materials. Brooman Point, Nunavut, in the Bathurst-Cornwallis Islands region of the High Arctic, was excavated in the late 1970s. The period of occupation was likely during the early 12th century AD. Each house was occupied for only a few years at most, with perhaps three to five houses in use at a single time, probably from autumn to spring. 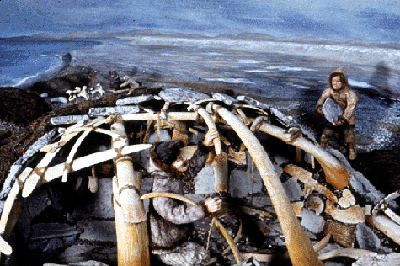 Other Thule communities comprised single-family, two-family and communal dwellings, as at Cumberland Sound on Baffin Island, where roofs were covered with sod, stone and baleen (another whale product). 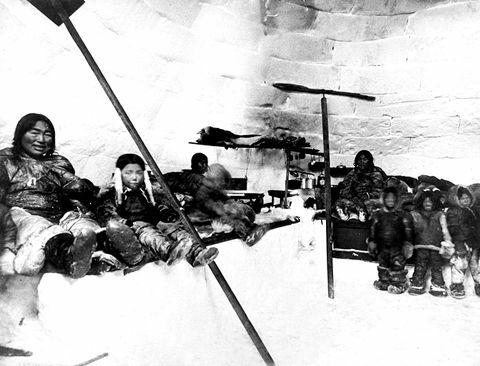 Interior of Iglulik snowhouse (igloo), with family, Cape Fullerton, NWT (photo by Albert Low, 1903, courtesy Library and Archives Canada/C-24522). 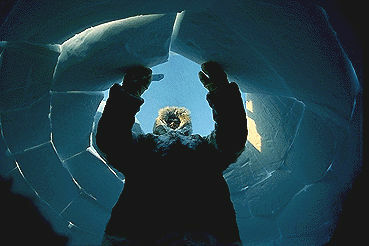 Contemporary Inuk man building an igloo (Corel Professional Photos). Section through a snowhouse, Davis Strait region, NWT. Drawing by Franz Boas from Boas, The Central Eskimo, 1888. The Inuit continued the habitation patterns of their Thule ancestors until early after contact, when whalebone houses were abandoned — perhaps because of the cooling climate during the Little Ice Age of the 17th to 19th centuries. The domed snowhouse (also called an igloo; iglu in Inuktitut) became the predominant winter dwelling form. The igloo form may well have been an old one: archaeologists have found snow knives among the Dorset people, the culture which preceded the Thule, suggesting that the Dorset may have built with snow prior to 1000 AD. The Inuit snowhouse was remarkable in that a vault was constructed without a scaffold or external support. A row of snow blocks was laid in a circle, and the top trimmed to begin a spiral incline. Subsequent blocks were shaped with slanting edges and laid in a spiral, each row inclined further inward to producing a round, domed shape. Snow was packed into the cracks. The interior was often lined with skins (sometimes the same skins that covered the summer tent), to prevent interior heat from melting the roof. A small hole at the top provided ventilation. The igloo conserves heat superbly by means of the natural insulation of snow and the use of a tunnelled entrance with a cold-trap. A large snowhouse would house a family through the winter. Typically these might be 3 to 3.5 m high and 3.5 to 4.5 m in diameter. Smaller snowhouses — perhaps about 1.5 m high and 2 m in diameter — were used as temporary dwellings during winter hunts or journeys, sometimes only as overnight shelter. Details of design differed from one region to another. Some used skin linings, while others did not. Entranceways might be flat-topped (as among the Inuinnait (Copper Inuit)), rather than vaulted or domed. Igloos were sometimes arranged in clusters, with a number of living chambers sharing a common entry tunnel or a communal facility, such as a feasting room or a dance house. Some clusters, as among the Iglulingmuit of Hudson Bay, might have as many as 10 domed units, each with a discrete function (e.g., living unit, dog kennel, storage). As temperatures rose above freezing, in late April or May, the snowhouse would begin to melt. The dome would be removed and replaced with a superstructure of skins, supported on the snow base. This inter-seasonal dwelling was known as the qarmaq; the name is also used to describe a hut of stone, turf or whalebone that was roofed with skins, and which might be used in autumn as well as spring. Summers are warm and a time for active hunting and fishing, which caused the community to become mobile. The Inuit lived in a simple tent (or tupiq), sewn from skins of seal, caribou or other animals. The skins were supported on poles, with the edges weighted down with rocks. Firepits were located outside. The tents’ portability allowed hunters to follow their prey. The Inuit along the Labrador coast, as well as some central groups, built tents with a conical rear portion and a triangular entrance area, with a horizontal ridge-pole between the two. This division into a longitudinal entrance and circular living space duplicates the plan of the snowhouse. The form of the tent varied among groups. The Iglulingmuit tent was simple ridge-type structure, not unlike the pup tent of today. 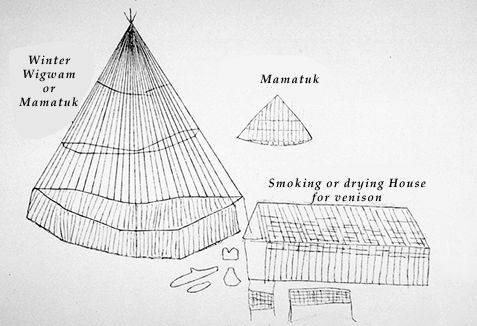 The tent of the Inuit of the Belcher Islands, in Hudson Bay, was conical with a central smoke-hole, similar to the Plains tipi. See also Architectural History: the French Colonial Regime; Architectural History: 1759-1867; Canadian Architecture: 1867-1914; Architectural History: 1914-1967; Architectural History: 1967-1997. Peter Nabokov and Robert Easton, Native American Architecture (1989).